Maine Crime Writers interviews Elizabeth Hand. Tor/Forge Q&A with Claire Ashgrove. If You’re Just Joining Us interviews Paul Goat Allen (podcast). 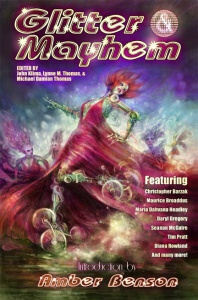 Weird Fiction Review interviews Michael Cisco and profiles O.L. Samuels. Suvudu (Matt Staggs) interviews Alan Lightman. Wizard’s Tower To Publish Juliet E. Mckenna. John Carter Test Screening Gets An Overwhelmingly Positive Review. Book View Cafe (Ursula K. Le Guin) on Fear and Loathing in e-Land. Janice Hardy on A Capital Idea! Knowing What to Capitalize. Grasping for the Wind (J. Kelley Anderson) on Making Room for Genre Fiction in the Western Literary Canon. Tor/Forge (Yves Meynard) on The Curse of the Magic System. Tor/Forge (Kristen Simmons) on Surviving Dystopia. Book Buroughing (Myke Cole) on Social Media, Publicity, and Local Writing Spots. Better World Books Blog (Christopher Barzak) Says Thank You to Fans of BWB. Omnivoracious (Susan J. Morris) on Some Write it Hot (Or, How to Make Your Editor Blush). Bryan Thomas Schmidt on How Not to Use the 9 Free Ways to Market Your Book. Lisa L. Hannett (Margo Lanagan) on Letting Ideas Cook. The Guardian (Damien Walter) on John Christopher’s imaginative universe. Christopher Priest on John Christopher obituary. Omnivoracious (Jeff VanderMeer) on New York Times Bestseller Beth Revis Brings You “A Million Suns”. GeekDad (Eric Wrecks) on 102 Essential Science Fiction Books for Your Kindle. The Seattle Times (Nisi Shawl) reviews ‘Three Messages’: Mexican stories of the fantastic. David Brin on More on the Difference Between Science Fiction and Fantasy. John Scalzi on Science Fiction and Fantasy Fans: Suggest Your Nominees, Please. Torque Control on BSFA Award Nominees: Short Story Club. David B. Coe on On Publishing: What is the Right Price for an E-Book? Excerpt: Touchstone by Melanie Rawn. Exceprt: The Dread by Gail Z. Martin. Preview video of John Romita’s The Amazing Spider-Man: Artist’s Edition.